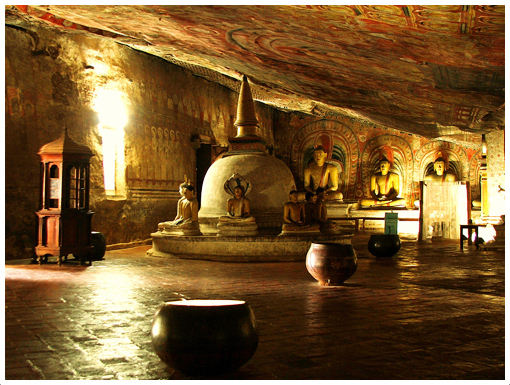 There are five caves (shrine rooms) in Dambulla temple. All of these caves arc full of statues of Buddha and various personages of the Buddhist Order or History. There are 150 Buddha images in these caves. Cave No. 5 (the last in order) has no historical value as it was done in the second decade of this century. All of the other caves contain statues and paintings representing various epochs of Sinhalese sculpture and painting.The early paintings of Dambulla are believed by some to belong to the 8th century A. C. But this cannot be proved at all because of over painting. Nevertheless this place is a mine of decorative designs, the patterns of which resemble those of Sigiriya. To a student of the history of Buddhism a careful study of the paintings of Dambulla provides a good deal of source material.It is generally accepted that the classical school of Sinhalese painting ceased to exist after the fall of the Polonnaruve kingdom at the end of the twelfth century. There are no extant examples of this style after the 13th century. It is from the 17th and 18th centuries that we have, once again, examples of the work of a school of indigenous painters. This School seems to have been influenced by the Schools of painting which flourished in the Deccan (Southern India) under the patronage of Muslim rulers.The frescoes which adorn the cave of Dambulla represent this new school of Sinhalese painting, Inside the cases of this temple the whole surface of the rock is completely covered with paintings, The earliest phase is believed to be on Cave No. 2, and these consist of decorative designs as surmised above, it is not possible to identify any one of these as actually belonging to a very much earlier period. Nevertheless, the designs themselves show close affinity to Sigiriya ceiling ornamentation. There may have been old painting at this place but perhaps these are lost or have been painted over later. It can be surmised that the designs of the decorative patterns, embody ancient ideas and may even be considered as continuing tradition of the designs at Sigiriya. But as the Da mbullu Tudapata referred to above clearly reveals cave No. 1, 2 and 4 of Dambulla were painted by the Kandyan artists of the seventeenth century by the order of king Senarat (1604-1635 A.C). In the reign of Kirti Sri Rajasinha, the paintings of Dambulla were renovated and over painted again. Paintings in Cave No. 4 clearly represent the new school of Sinhalese painting which flourished in the Kandyan provinces after the 17th century.